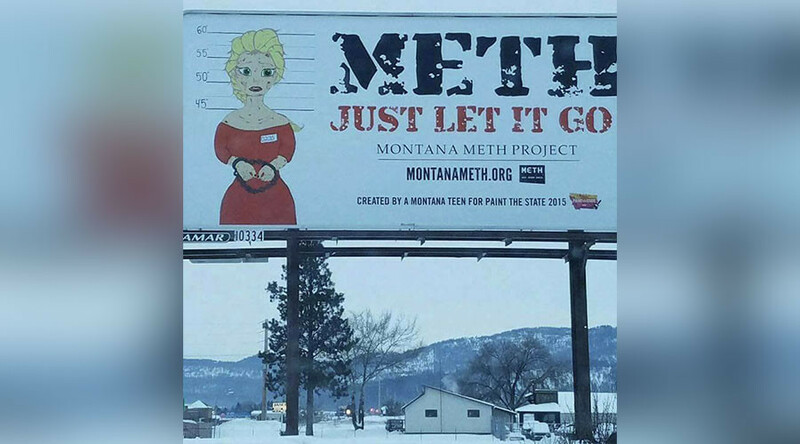 Elsa, from the hugely popular animated Frozen series, is being used as part of a billboard campaign in Montana warning teenagers of the dangers of methamphetamine. If it’s not the Disney star then it sure does look an awful lot like her. The billboard’s architects claim the picture was created by a teen from Montana for the Montana Meth Project which is a large-scale prevention program aimed at reducing first time teen meth use. The project uses public service messaging such as the billboard campaign along with public policy and community outreach. The Montana branch is part of the larger Meth Project which was set up by American businessman Thomas Siebel. Barron’s ranked it the third “highest impact giver” in 2010. There are currently projects in six US states and each has seen significant drops in meth use amongst teens.